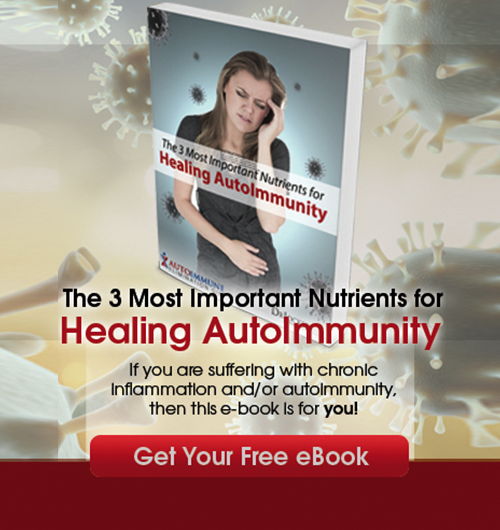 The autoimmune diet is a powerful way to reduce inflammation and autoimmune conditions. When the body is inflamed, your immune system is weakened. This can lead to the development autoimmune conditions. Continuing the cycle, autoimmune conditions cause more inflammation in the body. To prevent, improve, or heal from an autoimmune condition, it is critical to reduce the inflammation in your body. Choosing the right foods to nourish your body is one of the most critical factors for reducing inflammation and preventing or improving autoimmune conditions. The foods you consume every day have the power to heal your body or to harm and inflame your body. To lower inflammation and improve autoimmunity, you should eliminate pro-inflammatory foods that may be triggering an immune response. Replace those foods with the 12 best foods to reduce inflammation which are discussed in this autoimmune diet article. 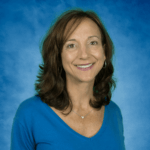 What is an Autoimmune Condition? Your immune system is your body’s defense mechanism. It is designed to protect you from disease and other potentially harmful foreign invaders. When functioning properly, the immune system identifies and destroys threats such as viruses, bacteria, and parasites. An autoimmune condition occurs when the body’s immune system turns on its own cells and tissues. The immune system mistakenly identifies the healthy cells and tissues as foreign invaders and mounts an attack to destroy them. This can happen in almost any part of the body, including the brain, muscles, skin, and other organs. Autoimmune conditions are usually chronic and may be life threatening. There are around 140 autoimmune diseases or diseases with an autoimmune basis. Millions of Americans suffer from one or more of these autoimmune conditions (1). Around 80% of people with autoimmune conditions are women. While the specific cause of autoimmunity is not clear, research suggests that there may be a genetic susceptibility to autoimmunity and different environmental triggers that bring on the condition (2). For more detail on these factors and how each may play a role in contributing to autoimmunity, you can read this article. The gut is critically important with autoimmune conditions because gut bacteria heavily regulate your immune system. In fact, 70% of your immune system resides in your gut. One of the main ways that the factors above lead to autoimmunity is by inflaming and damaging the gut and destroying the beneficial bacteria. When the gut lining is damaged, it can become porous. Foods and other things that you are consuming pass through these holes in the gut lining and into your bloodstream. Your immune system is exposed to these foods and reacts to the foods as a threat, amplifying the immune response. For this reason, people with autoimmune conditions are more likely to have food sensitivities. A recent observational study found a clear difference in food sensitivity profiles for people with autoimmune diseases (3). IgG levels for specific food antibodies were significantly higher in patients with autoimmune conditions which means they had a greater immune reaction to these foods. It is important to remove foods that may be causing an immune response to prevent and improve autoimmune conditions. Food sensitivities can be hard to identify because symptoms are usually delayed up to 72 hours after consuming the offending food. These symptoms include more than digestive issues, such as migraines, fatigue, joint pain, and skin issues. 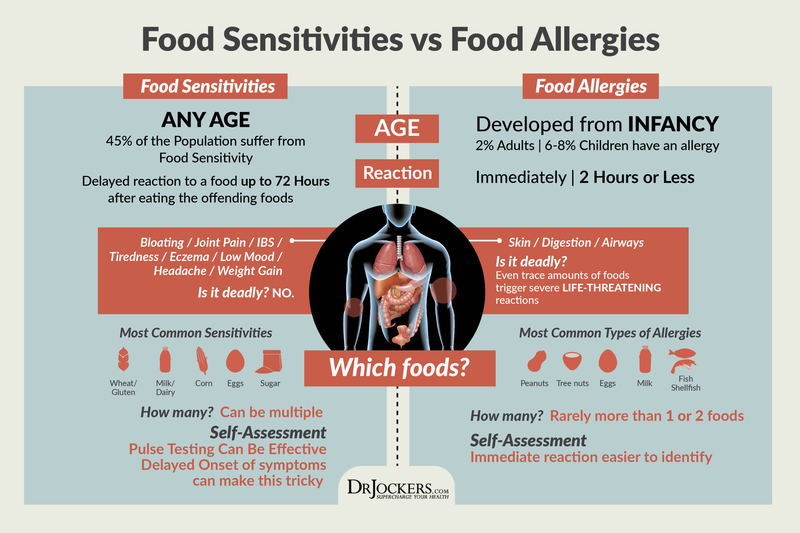 Testing for food sensitivities is a good option for people with autoimmune conditions. For information about different methods of testing, check out this article. 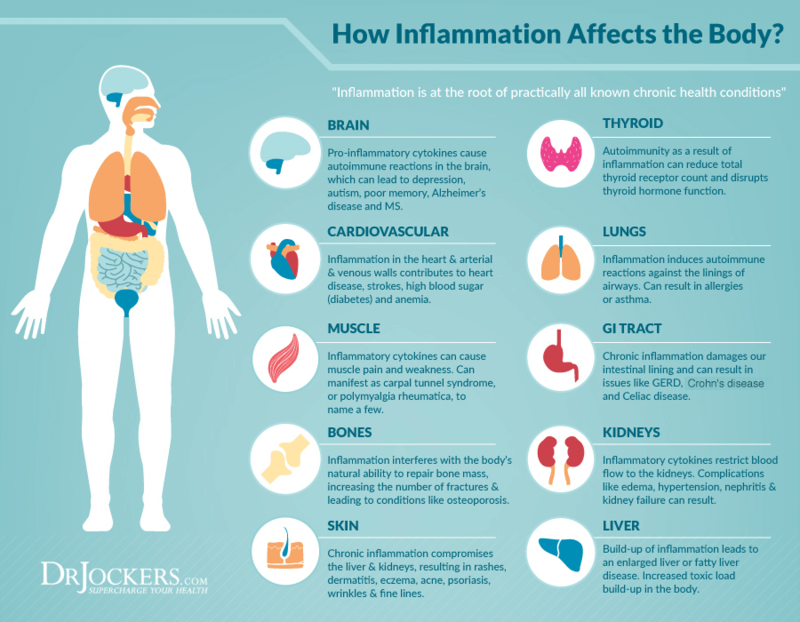 A major contributor to autoimmune conditions is inflammation. One of the leading causes of inflammation is a poor diet such as the Standard American Diet (SAD). The foods included in the Standard American Diet (SAD) diet are extremely inflammatory. They contain high levels of advanced glycation end products (AGEs), or glycotoxins (4). These compounds cause inflammation and oxidative stress, damaging tissue throughout the body. It is critical for anyone with an autoimmune condition to consume an anti-inflammatory diet. An autoimmune diet eliminates foods that cause inflammation and includes foods that reduce inflammation in the body. For more information on the benefits of a healing diet for reducing inflammation, read this article. The autoimmune diet focuses on real whole foods that are the least likely to trigger an immune reaction. Deficiencies in antioxidants, vitamins, and micronutrients can affect the body’s ability to resolve inflammation. Consuming micronutrient rich foods can help to reduce inflammation, support your immune system, and improve autoimmune conditions. It is also important to make sure these foods are organic because pesticides have been linked to autoimmune conditions (5). 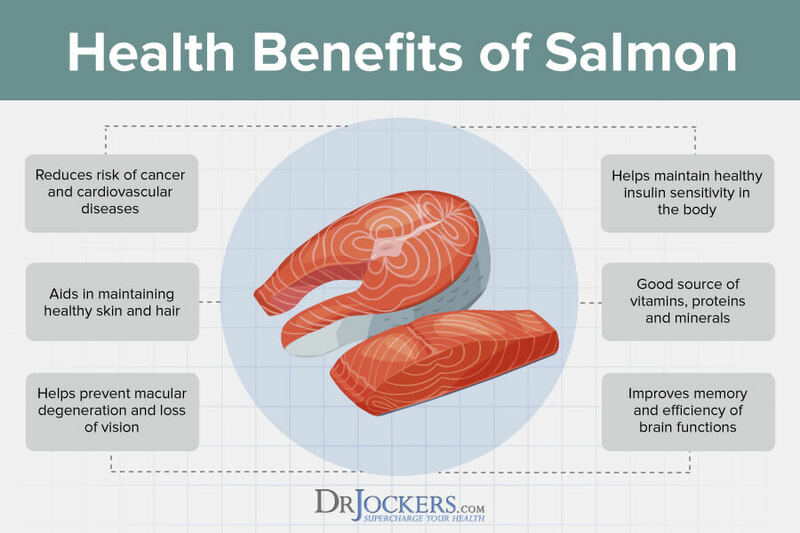 Wild-caught fatty fish are a fantastic component of an autoimmune diet and can benefit anyone with chronic inflammation. They contain the omega-3 fatty acids EPA and DHA which have been shown to help reduce inflammation. Your body metabolizes EPA and DHA into compounds called resolvins and protectins which act as anti-inflammatories. DHA has been found to not only decreases cytokine production and reduce inflammation but to actively promote the resolution of inflammation (6). Another important consideration for reducing inflammation is the ratio of omega-3 fatty acids to omega-6 fatty acids in your diet. While omega-3 fatty acids reduce inflammation, most omega-6 fatty acids increase inflammation in the body. The Standard American Diet (SAD) includes high amounts of oxidized omega-6 fatty acids found in corn and soybeans. Consuming a diet with higher omega-6 to omega-3 ratios may worsen inflammation over time (7). Instead, aim for the ideal ratio which is between 4:1 and 1:1. Consuming olives and extra virgin olive oil is great for reducing inflammation. Olives and olive oil contain anti-inflammatory compounds such as antioxidants, macronutrients, and monounsaturated fatty acids. Olives fiber, vitamin E, vitamin, copper, and calcium. Olives and olive oil should be key components of a well formulated autoimmune diet. Olive oil contains biologically active phenolic compounds (polyphenols) (8). Phenolic compounds have positive effects on plasma lipoproteins, oxidative damage, inflammatory markers, platelet and cellular function, and antimicrobial activity. Extra virgin olive oil is the healthiest form of olive oil and has the richest flavor. It is made without any heat or chemicals and has a low smoke point. 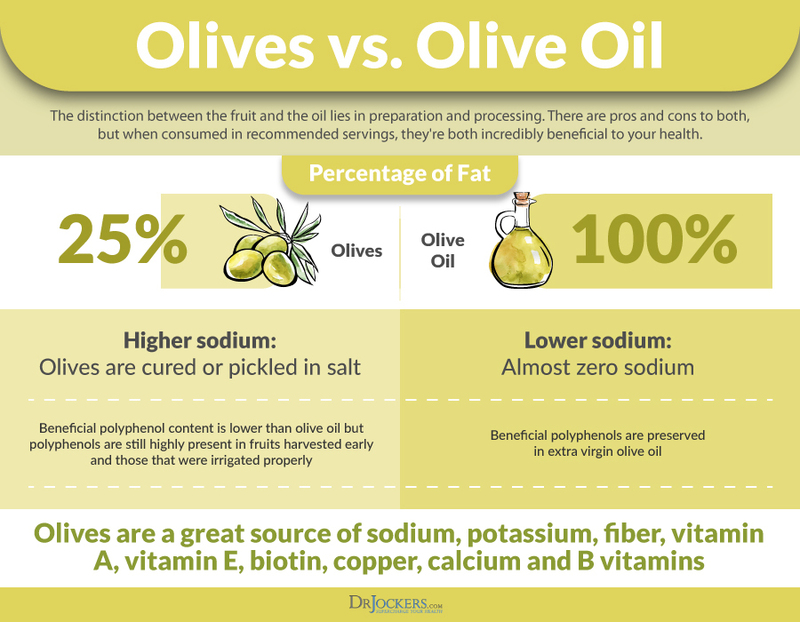 Because of its low smoke point, extra virgin olive oil is best used drizzled over cooked or raw foods, or as a salad dressing. In the fight against inflammation, turmeric is a powerful weapon. Turmeric is a spice and medicinal herb that has been used for centuries for its healing properties. Turmeric’s active compound, curcumin, is a polyphenol responsible for the yellow color of turmeric. Curcumin has anti-inflammatory, antioxidant, anti-carcinogenic, anti-thrombotic, and cardiovascular protective benefits (11). It has even been shown to boost the body’s natural antioxidant capacity which fights damaging free radicals. Turmeric powder should be added to foods after cooking to maintain its potency as an anti-inflammatory. Add a dash of black pepper and eat with healthy fats to allow for better absorption of the beneficial compounds. You can also supplement with turmeric. My favorite turmeric supplement is Fermented Turmeric. Berries, such as blueberries, blackberries, raspberries, strawberries, and cranberries, are packed with powerful nutrients. Berries contain vitamins, minerals, and polyphenols. The most notable polyphenols in berries are anthocyanins which give berries their distinctive colors. Anthocyanins have demonstrated antioxidant, anti-carcinogenic, and anti-inflammatory biological activity. In addition to anthocyanins, berries contain abundant phytochemicals including ellagic acid and the flavonoids catechin, quercetin, and kaempferol (12). These compounds have antioxidant, anti-carcinogenic, and anti-inflammatory activity. Another fruit that is excellent for reducing inflammation is cherries. Cherries are a rich source of polyphenols and vitamin C, both of which have antioxidant and anti-inflammatory properties. Studies show that consuming sweet or tart cherries can prevent or decrease oxidative stress and inflammation (13). 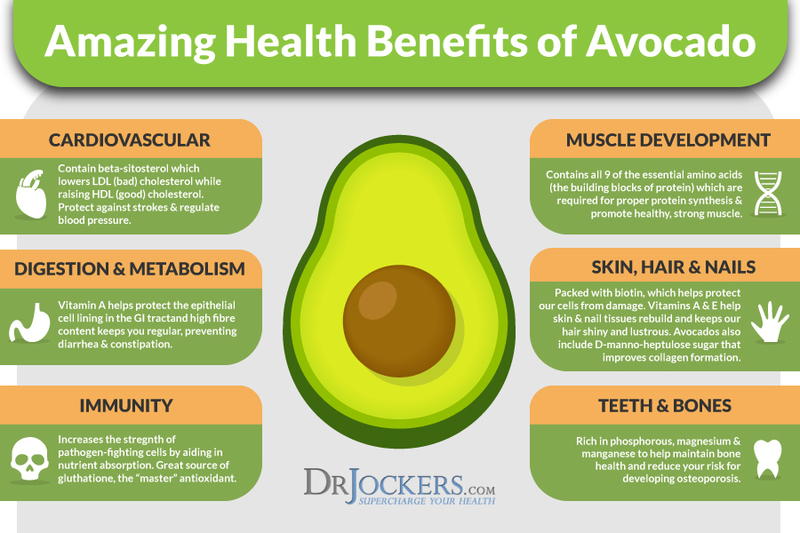 Avocados are nutrient and phytochemical dense superfoods. The numerous beneficial compounds in avocados make them incredible for fighting inflammation in the body. Avocados are packed with antioxidant phytochemicals, including beta-sitosterol, glutathione, and lutein. Glutathione, commonly referred to as “the master antioxidant” is crucial for good health. Glutathione and beta-sitosterol help to protect the body from free radical damage. Additional antioxidants in avocados include vitamins B, C, E, and K. These vitamins help neutralize free radicals and reduce cellular inflammation. Avocados contain the carotenoids, lutein and zeaxanthin which also have antioxidant properties. Avocados are an excellent source of potassium along with other important trace minerals such as sodium, and magnesium. These minerals can help reduce inflammation. Avocados are also rich in choline, an essential nutrient needed for metabolism. Avocados are fiber-rich, low in carbohydrates, and loaded with healthy monounsaturated fatty acids (MUFAs) and healthy cholesterols. Studies have shown that dietary MUFAs are protective against metabolic syndrome and cardiovascular disease risk factors (14). The fats also help the body absorb the nutrients in avocados. Dark leafy green vegetables are packed with an array of vitamins, minerals (including trace minerals), and fiber. Some of the most nutrient-dense leafy greens are spinach, kale, chard, arugula, swiss chard, and collards. Bok choy is another superfood leafy green vegetable that has potassium, manganese, and magnesium. Spinach, kale, chard and other dark leafy green vegetables are true superfoods. They contain almost 400% of the recommended daily value of vitamin A in just one cup. They also contain vitamin C, vitamin E, vitamin K, and folic acid. The abundant antioxidants in leafy greens protect cells from damaging free radicals. It is important to combine leafy greens with healthy fats for better absorption of the fat-soluble vitamins. 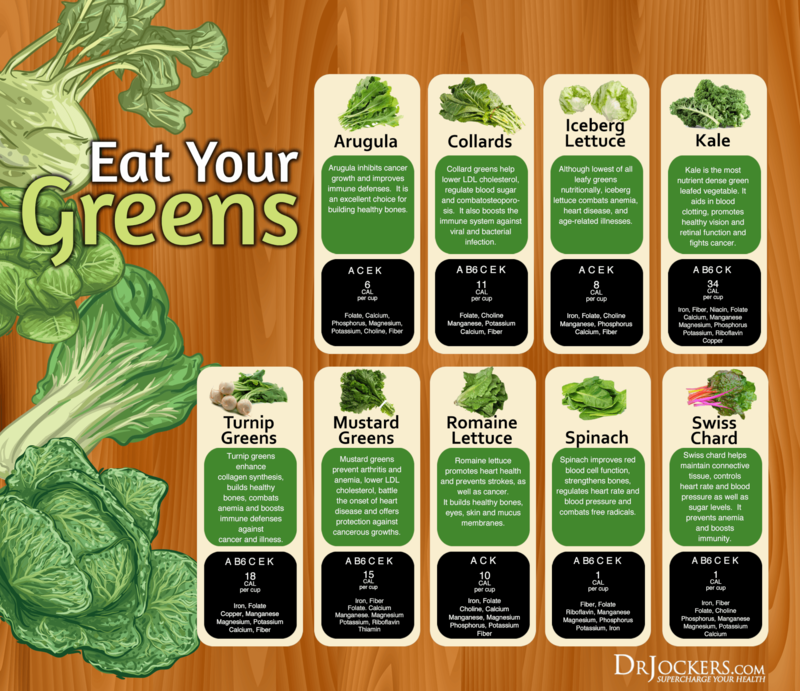 You can also consume a high-quality greens powder such as Organic Supergreens with 28 organic and living superfoods. Green tea is widely considered to be beneficial for health for its anti-oxidative and anti-inflammatory effects. It contains the polyphenol epigallocatechin gallate (EGCG) which is the major and most active component in green tea. EGCG has been shown to mitigate cellular damage, scavenge free radicals, and reduce inflammatory reactions in the body (15). 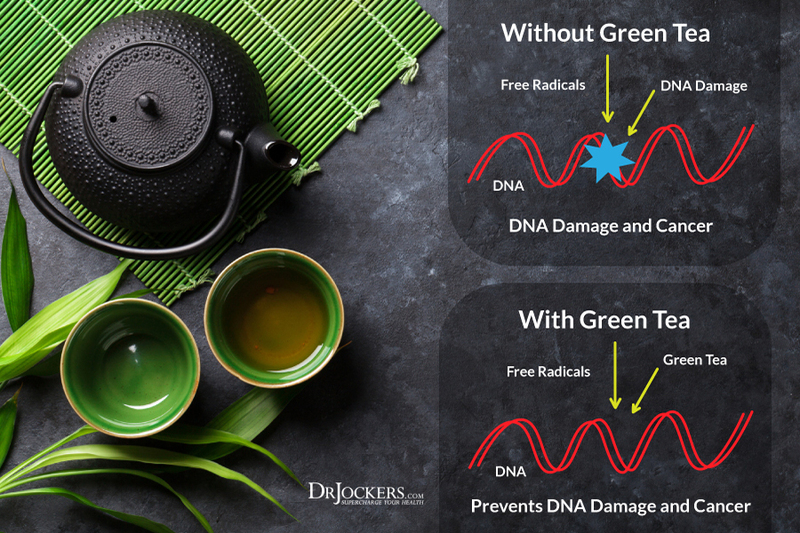 Green tea is rich in quercetin which is a potent antioxidant and anti-inflammatory. It also helps to promote the production of the antioxidants glutathione and superoxide dismutase (SOD). These antioxidants drastically lower inflammation in the body. It is very important to consume organic green tea because conventional green teas are highly sprayed with toxic pesticides and herbicides. The best type of green tea is matcha green tea which can have as much as ten times the amount of antioxidant compounds as standard brewed green tea. 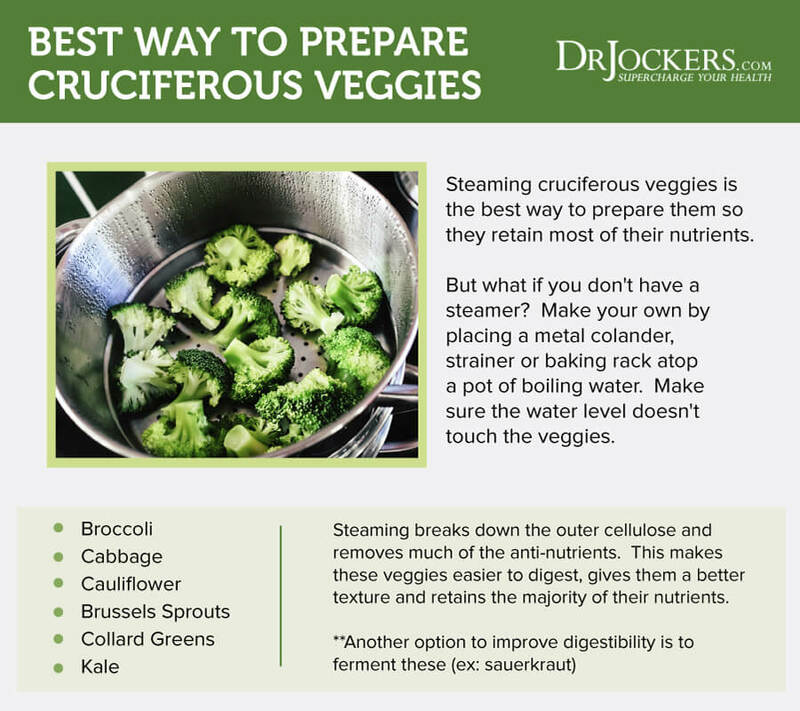 Cruciferous, or brassica, vegetables are among the most nutritious foods you can eat. They offer an array of vitamins and minerals and are rich in phytonutrients, carotenoids, and flavonoids. These compounds are a great part of the autoimmune diet because they help combat free radical damage and neutralize toxins in the body. Cruciferous vegetables contain glucosinolates which increase the production of enzymes. Glucosinolates are sulfur-containing compounds that are broken down into metabolites. Metabolites trigger specific enzymatic reactions that help detoxify the liver and increase its ability to remove carcinogens and heavy metals from the blood. They also aid in digestion (16). Cruciferous vegetables include Brussels sprouts, broccoli, cauliflower, kale and mustard greens. They have a characteristic bitter taste and pungent aroma. Broccoli is a powerhouse cruciferous vegetable that is a fantastic source of sulforaphane. Sulforaphane is the powerful isothiocyanate (ITC) that reduces cancer cell replication and boosts the immune system. Coconut oil contains small to medium-chain saturated fats called medium-chain triglycerides (MCTs). MCTs permeate cell membranes to provide energy without the need for carrier proteins or special enzymes. This can be a really helpful source of calories on the autoimmune diet. Saturated fatty acids constitute at least 50% of our cell walls and offer protection against unwanted materials invading the structural integrity of the cell wall. Coconut oil is the most stable source of fatty acids due to its high amount of saturated fats (92%).This stability is important because it reduces the free radical load on our bodies. Free radicals are unstable molecules that can damage our cells. Coconut oil is rich in lauric acid, capric acid, and caprylic acid. This combination of fatty acids has an anti-inflammatory and immune boosting effect through their antiviral, antimicrobial, and antibacterial properties (17). Coconut oil also helps to balance blood sugar and increase ketone production which reduces inflammation. It is best to use organic, unrefined coconut oil to reap the many benefits of coconut oil. Coconut oil is great for cooking because it has a higher smoke point than many other oils (like extra virgin olive oil). Rather than oxidizing, coconut oil remains stable and does not lose its antioxidant properties under high temperatures. Mushrooms are superfoods that have been used for thousands of years for their nutritional and medicinal value and are a valued element of the autoimmune diet. They are rich in anti-inflammatory compounds such as polysaccharides, phenolic and indolic compounds, mycosteroids, fatty acids, carotenoids, and vitamins (18). Metabolites from mushrooms have antioxidant, anticancer, and most significantly, anti-inflammatory properties. that strengthen and balance the immune system. Mushrooms contain a number of polysaccharides including beta-glucan. Beta-glucan is a powerful immune stimulating compound that binds to the surface of innate immune cells. This reduces the tendency towards autoimmune reactions and hyperinflammatory activity when the body is under attack. Many spices and herbs are carminative. Carminative herbs are herbs that help to improve digestion, prevent the formation of gas in the intestinal tract, and remove gas from the digestive tract. They help to soothe the gut, modulate intestinal contractions, and stimulate bile flow. Examples of carminative herbs are arugula, basil, black pepper, cilantro, cinnamon, garlic, ginger, peppermint, rosemary, sage, fennel, thyme, and turmeric. Carminative herbs contain powerful antioxidants and phytonutrients with anti-inflammatory effects. Great ways to use carminative are in herbal teas, essential oils, fresh herbs, chew on fennel, in juices and fermented vegetables and drinks. For more information on carminative herbs and seven reasons to use them, check out this article. Bone broth and collagen are excellent for healing and repairing the gut and key parts of the autoimmune diet. They help to soothe and heal inflamed tissues in the gut. This strengthens the immune system as digestive issues are often the root cause of chronic inflammation and autoimmunity. For people with gut inflammation, it is important to get easily digestible protein into their bodies. Bone broth and collagen are easy to digest and contain amino acids which support a strong gut lining. As the gut heals and the immune system stabilizes, food sensitivities, which are common with autoimmunity, can improve. Bone broth and collagen protein can be made at home or purchased in liquid or powdered form. My favorite brand of liquid premade bone broth is Kettle & Fire (here) while my favorite powdered form is the organic bone broth collagen protein. You can use the powdered form in smoothies and shakes to get more of these key nutrients, but should only be mixed with water during the fast. We carry organic bone broth collagen protein in sugar-free vanilla, chocolate and pure flavor. People with autoimmune conditions should avoid pro-inflammatory foods and foods that are most likely to create an immune response in the body (food sensitivities). The autoimmune diet takes into account the most common foods that people struggle with. When you have a sensitivity to a food, the food will trigger your immune system to react. The foods that are most likely to cause an immune response include gluten, dairy, eggs, peanuts, tree nuts, soy, wheat, fish and shellfish. Many people are also sensitive to nightshade vegetables (tomatoes, potatoes, eggplant, bell peppers), corn, legumes, all grains, processed foods, and vegetable oils. These foods should be eliminated if you have an autoimmune condition. 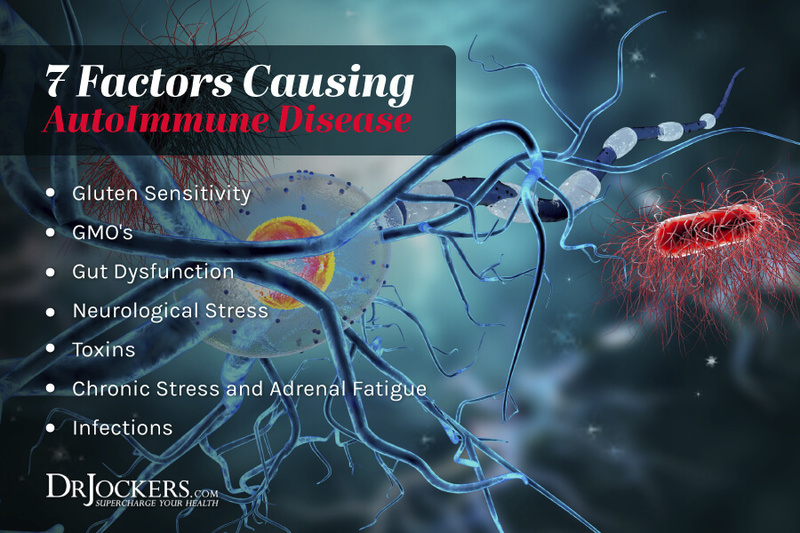 Autoimmune conditions occur when the body’s immune system turns attacks the body’s own cells and tissues. 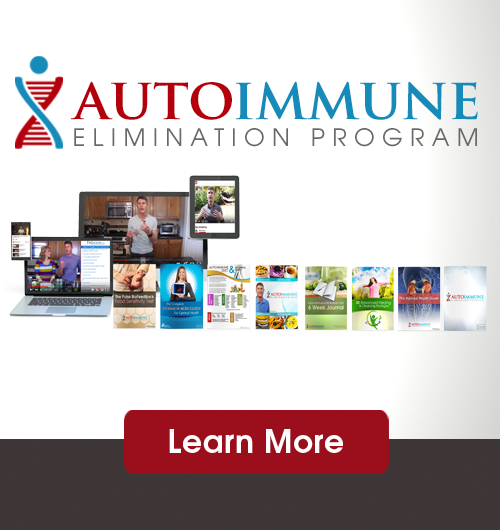 Inflammation is a cause of autoimmunity, and autoimmune conditions can increase inflammation. Therefore, it is critical for anyone with an autoimmune condition to reduce inflammation. The foods we eat every day have a huge impact on the amount of inflammation in our bodies. Food has the power to heal the body or to harm the body. To reduce inflammation, you should eliminate pro-inflammatory foods and foods to which you may have a sensitivity. Replace these harmful foods with anti-inflammatory foods that can benefit the body. There are 12 top anti-inflammatory foods for autoimmune conditions. These foods include omega-3 rich fatty fish like salmon and the healthy fats found in avocados, olives and extra virgin olive oil, coconut oil. Berries, cherries, leafy greens, broccoli and other cruciferous vegetables, and mushrooms are fabulous anti-inflammatory fruits and vegetables. Herbs like turmeric and carminative herbs are excellent for fighting inflammation, as well as green tea, bone broth and collagen. Great and informative article! I was wondering what your thoughts on ground meat are. I have been buying ground organic, pasture raise turkey regularly because I don’t do well with a lot of chicken, I don’t like to eat pig for health reasons and I’m avoiding too much red meat because I have endometriosis. That leaves pretty much turkey and salmon (the other fish arent easy to find and I’m having trouble with the idea of sardines and anchovies!). Is ground Turkey ok if it’s organic and pasture raised? I’ve heard mixed things on ground meat so I wanted your opinion. Other than turkey and salmon I do eat chickpeas and lentils which I seem to do fine with despite having leaky gut. Thanks! Yes you can do organic pasture-raised ground turkey that is no problem. Always best to get your meat from organic sources. I find it interesting that you say we should never eat canned tomatoes. Can you explain why? Hey Cherie, canned tomatoes leach out BPA and aluminum from the can. So they carry a tremendous load of environmental chemicals with them. Hard to beat medical hemp (high in CBD, less than .3 THC) as a carminative herb. Great article, and it confirms that my diet choices are just right. My biggest hurdle recovering from Scleroderma has been restoring my microbiome after almost two years on Minnocin, which is tetracycline. That stuff literally nearly killed me instead of the mycoplasm, poisoning my liver and leaving my entire body covered in blisters when they changed drug manufacturers at a dosage increase. I’ve tried probiotics & prebiotics and I eat plenty of fermented foods, but I still struggle often with joint pain. Fasting has been the way forward for me. I spent years researching the effects of food, how to eat “clean” and bought lots of books on healing diets, they mirror what you’ve said here. Thanks, doc! Sorry to hear about your past issues. Great to hear you are doing well with this diet Nora!! Blessings to you! Love reading your very informative articles, even if already know about the subject….you explain things very clearly. Today though, surprised that you’ve written that turmeric should be added to food only after cooking. Almost everywhere I’ve been reading that turmeric either should be cooked with our food or then boiled in either milk or water if drinking it….since it’s so difficult to absorb. We in India add turmeric to almost everything we cook, a pinch or a little more, I’ve started to add it to my eggs also,wherever I can & have been drinking turmeric/ milk regularly now for the last two years- I’m a Spina Bifida/ sacrum area with a very damaged spine & I feel that turmeric has been my savior with the excruciating back I’d been having….on the whole disappeared ….Shallaki May have helped me with the turmeric. I’m curious Dr Jockers why you think that it’s fine to take turmeric without cooking it. Hey Sarah, yes that is fantastic that you use turmeric in your dishes. The problem is that when you cook it at high temperatures it will reduce some of the anti-oxidants. It is still very beneficial however to cook with it…you just don’t get the maximal benefits. and To get the maximal benefits…add it to your milk, eggs, etc at the end of the cooking cycle. Blessings! Thanks so much Dr Jockers for that clarification…..add the turmeric at the end of the cooking cycle. Will remember that in the future. And thanks again for the great information you give us in your newsletters.